The historic market town of Higham Ferrers is located in the Nene Valley in East Northamptonshire, close to the Cambridgeshire and Bedfordshire border. It forms a single urban area in conjunction with Rushden to the south. Its close proximity to the junction of the A45 and A6 provides excellent links to the national routes of the A1, M1 and A14. The town has prospered with markets and fairs with ancient connections still evident by the number of historical sites in the town, including the site of William Peverel's old castle. Henry Chichele (c. 1364 – 12 April 1443) was born in Higham Ferrers and is noted for becoming Archbishop of Canterbury and founding All Souls College, Oxford. He was also instrumental in the founding of Chichele College in 1422, the Bede House and the Chantry Chapel. In the Lancastrian period Higham Ferrers became one of the centres of the administration for the Duchy of Lancaster. Some of this land has now been sold off for development, but the Queen, as the Duke of Lancaster, still has considerable landholdings around the town. Higham Ferrers, despite its ancient charter and privileges was conservative in outlook, and although industry was carried on from early times, it grew comparatively slowly. It was one of the leading boot, shoe and leather towns in the county because hides were abundant from the cattle that was farmed in the Nene Valley and the river provided easy and cheap transport. River transport declined once the railway arrived at the town in the mid 19th Century (Nene Valley Railway) near Raunds. In 1894 a short branch railway from the Midland Main Line at Wellingborough was opened with stations at Higham Ferrers (terminus) and Rushden. Although improvements were planned to link the line to the Kettering-Huntingdon line, this never happened and the line was closed completely in 1969. 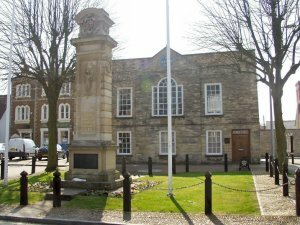 For many years Higham Ferrers was larger than its neighbour Rushden, but as the town grew less rapidly than its neighbour in the 19th century, it has retained many of its historic limestone buildings in the town centre. Rushden is now much larger than Higham and growth patterns have seen the convergence of the two towns, but they both still retain their distinctive characteristics. Higham Ferrers has now shared in the house building boom of the last two decades, expanding considerably with the construction of the Kings Meadow Lane estates. There are now 3285 dwellings in the town (2011 census).